Gabe Skop, (he’s the one on the left) now 19, is not a man of many words. Affectionate and warm, he’s always ready with a hug, enjoying many good friendships with guys and girls alike. This year, he’s having a particularly Israeli experience at a Mechina, or pre-army program. The Mechina movement exploded in post-Rabin-assassination-Israel along with the realization of the growing rift between secular and religious Israelis. Gabe’s Mechina, Aderet, is pluralistic, catering to kids who come from all kinds of backgrounds, many of them at a point in their lives where they want the freedom to explore their religious identity in a non-judgmental environment – that is, away from Mom and Dad. And then, after a short break, it was Gabe’s turn. He scrawled the word, מפגר, or ‘retard,’ on the whiteboard. Asking the crowd what the word meant to him, there was a discussion of the misuse of the term, the redirection, if you will of a diagnosis into a negative word, a curse word even, at times. He gave the dictionary definition and then, p ut up a picture of Akiva. 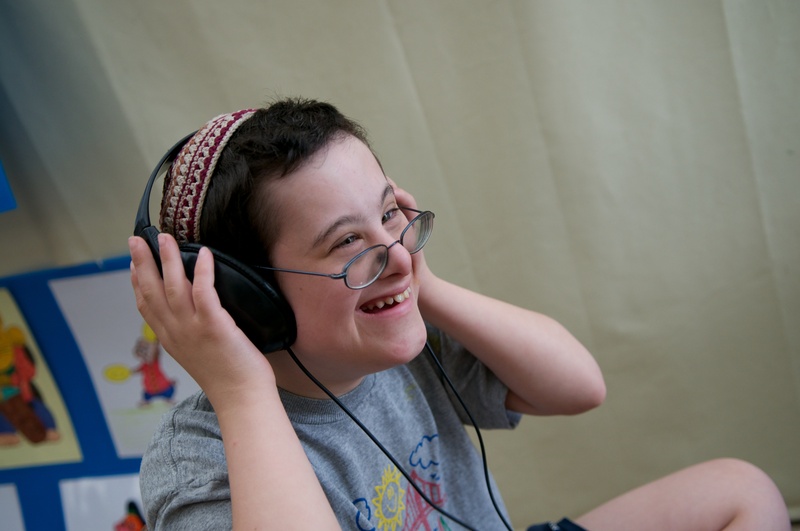 It said underneath the picture – and it was of Akiva at his cutest, ‘smilingest’ best – this is my brother, Akiva, he has Down syndrome. He went on to explain a bit about the syndrome as well as answer questions about Akiva and his development and what he’s like before moving on to Bill’s article and a heated discussion about abortion. It went well. I was proud, overwhelmed really. Note: This article was written and published in the now defunct Big Apple Parents Paper in 2004 when Akiva was 7. I re-read it after reading Bill Kolbrenner’s article, The Courage to Embrace Imperfection. Story of my life, or our often complicated, difficult but ultimately happy life as parents to Akiva, now 14.5. People in their bumbling sort of way just blurt out what bothers them most when they discover that my son has Down syndrome; that I didn’t know, or worse, chose not to know. Many feel that not knowing was irresponsible and that not testing was simply, in this day and age, playing with fire. Had I done pre-natal testing (namely amniocentesis) during my third pregnancy eight years ago, I would have known that the fetus had a genetic abnormality and I would have chosen – and most would have agreed that it was the most sensible course – to abort. I like to think that since the birth of our youngest son (now seven) that many of our friends, who know him well, have re-thought their attitudes towards pre-natal testing; that they would stop and consider what it really means to test and abort what originally had been a desired and probably planned pregnancy. The reality, I find, is quite different. Most women have a strange “disconnect” when it comes to abortion and the genetically “undesirable” fetus. Having come to maturity during the age of a woman’s right to choose, most of my circle considers it their absolute right to choose pregnancy and not have it chosen for them. They planned their families just as carefully as they planned what grad schools to attend, when to marry and where to purchase their first homes. They chose to become pregnant, and unless that choice led to infertility and its’ corresponding difficulties, they became pregnant. Once pregnant, they set out to have the perfect pregnancy, complete with appropriate exercise classes, maternity outfits and practitioner, who would deliver said healthy baby at the best hospital when the time came. They wanted their babies; those perfect babies, the ones with the number ten apgars at birth. This is what women have been led to believe is their right – the modern protocol for having a family – perfection. In a recent New York Times Op Ed article, Barbara Ehrenreich spoke of the problem of admitting to an abortion when it’s to end a pregnancy that hasn’t tested well. She quotes a woman from an earlier NYTimes article about genetic testing who says “I don’t look at is as though I had an abortion, even though that is technically what it is. There’s a difference. I wanted this baby.” If abortion is something that we believe in, shouldn’t we believe in it regardless of the reasons that lead a woman to end her pregnancy. Ehrenreich write, “The prejudice is widespread that a termination for medical reasons is somehow on a higher moral plane than a run-of-the-mill abortion.” If we choose to abort then we must acknowledge it honestly and not sugar coat what was most likely a difficult decision made for our own personal reasons. 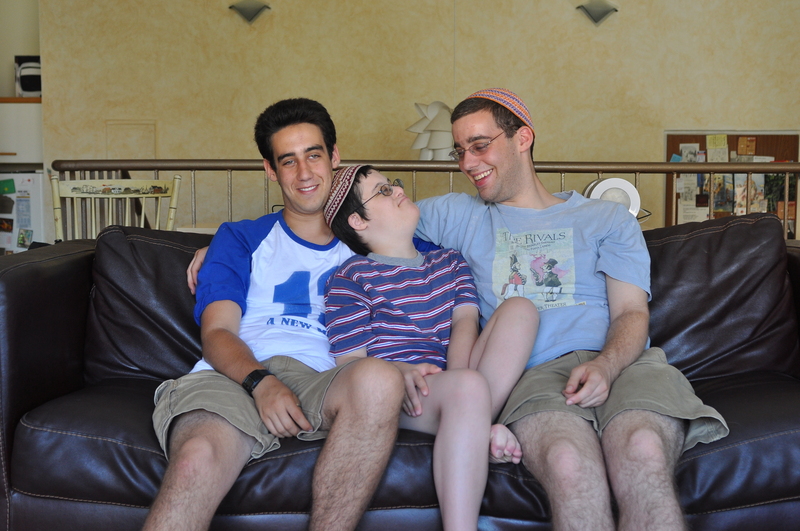 There is an organization in Crown Heights, which places children born with Down syndrome in adopting families. I remember reading about this organization and was struck by something the founder said. He commented that the first thing he would do when called by a family looking to give up a new baby for adoption would be to counsel the new parents to keep their baby at home for six weeks. He found that in many cases, once the families went home with their babies, they realized that this new member of the family, while presenting potentially unknown obstacles, was essentially a baby, what they had wanted in the first place. It always seems that this basic fact is forgotten in the smorgasbord of pre-natal testing and the assumed tragedy of a bad result. If we have chosen our pregnancy, then we chose it as a way to achieve parenthood. We happily assumed that are babies would be healthy. That’s a human response. Can’t we also choose to parent a child with a disability? We recoil at imperfection, fear its complications and assume that less-perfect babies will not be as sweet, loveable and delightful as their “perfect” peers. Why aren’t mothers-to-be (and their partners) counseled to understand what it might mean to parent a child with special needs at the same time that we sign the permission slip for the amnio? Do we consider the ethical and moral implications of aborting what was once a desired baby once it has been deemed an imperfect fetus? Can we live with our choice to abort and call it what it is, even if that is a painful admission, a word that gives us a twinge in our hearts for what was wanted and given up. Parenting a child like mine is at times a painful one. He’s chronologically seven, but operates at a much younger level. He sat up unassisted at 22 months, walked at 6 and requires assistance for most of his basic needs. He’s not moving at a fast pace in any area of his life, although his geneticist recently commented that in the area of speech he’s atypical (in a good way). This was a novel notion for my husband and me – the thought that he could be ahead of the game in something (for kids with Down syndrome, that is). What are the plusses I often wonder when I am at my most frustrated and fatigued with seven years of continual toddler hood? The knowledge that he was a planned and wanted baby. My husband and I dickered over the third child – things were finally easing up and he for one, liked that. But I kept visualizing that third child; I saw myself walking down the street with my two big boys by my side and my husband pushing a stroller with a new baby inside. We have fleshed out the vision, grown as a family and understand now that rearing a disabled child is still just parenting as we always knew it. A week after our son was born, my husband chatted with another family we know – their son has a very physically debilitating form of Cerebral Palsy. When he asked them, “Will we ever be normal?,” they responded, “You’ll be better than normal.” Indeed, we think of ourselves as wizards in a land of Muggles (to use the Harry Potter terminology). We understand something that makes the rest of the world squirm; what’s so bad about being retarded, really? I can’t answer what I would have done had I tested – at this point it’s too absurd for me to contemplate – but I do know that I’m content with the choice I made eight years ago. Let’s stand up as women – informed and honest about our choices, all of them. Let’s bear the responsibility not only of those choices that we wanted but of those that we fear. If the time is right, as it was for my family, it could be the best choice you’ll ever make.